The long winter chill is behind us, and summer is right around the corner! Boiling Midwestern temperatures may seem far off, but they are closer than you think. Get your air conditioning unit in shape for the warmer months by giving it a proper inspection, cleaning, and temperature setting. Not sure where to start? 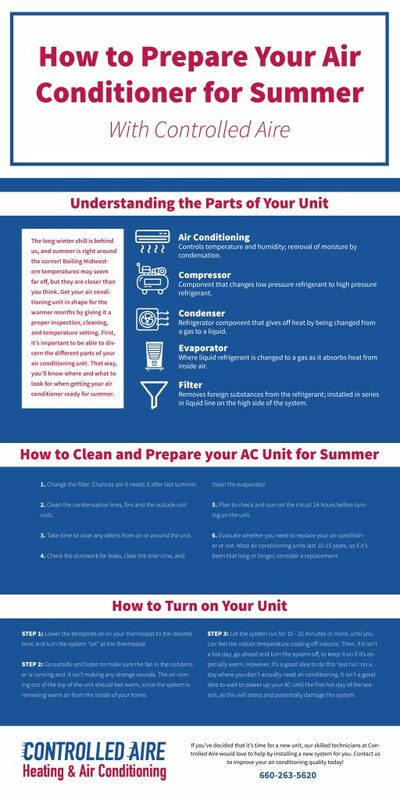 In this blog, we’ll give you a guide to help you prepare your air conditioning unit for summer. First, it’s important to be able to discern the different parts of your air conditioning unit. That way, you’ll know where and what to look for when getting your air conditioner ready for summer. 1 – Air Conditioning: Controls temperature and humidity; removal of moisture by condensation. 2 – Compressor: Component that changes Iow pressure refrigerant to high pressure refrigerant. 3 – Condenser: Refrigerator component that gives off heat by being changed from a gas to a liquid. 4 – Evaporator: Where liquid refrigerant is changed to a gas as it absorbs heat from inside air. 5 – Filter: Removes foreign substances from the refrigerant; installed in series in liquid line on the high side of the system. Before you power up your air conditioning unit, it’s important to inspect and clean all parts of the system. First things first, go ahead and change the filter. Chances are it needs it after last summer. Next, you’ll want to clean the condensation lines, fins and the outside unit coils. When you’re outside cleaning the unit coils, also take the time to clear any debris from on or around the unit. You’ll also want to check the ductwork for leaks, clear the drain line, and clean the evaporator. Additionally, plan to check and turn on the circuit 24 hours before turning on the unit . While you’re checking and cleaning, take the time to evaluate whether you need to replace your air conditioner or not. Most air conditioning units last 10-15 years, so if it’s been that long or longer, consider a replacement. Yes, replacing your unit is expensive, but in the long run, it’s cheaper, as you’ll be cooling your house more efficiently than you were with a worn out AC. Step 2: Go outside and listen to make sure the fan in the condenser is running and it isn’t making any strange sounds. The air coming out of the top of the unit should feel warm, since the system is removing warm air from the inside of your home. Step 3: Let the system run for 10 – 15 minutes or more, until you can feel the indoor temperature cooling off indoors. Then, if it isn’t a hot day, go ahead and turn the system off, or keep it on if it’s especially warm. However, it’s a good idea to do this ‘test run’ on a day where you don’t actually need air conditioning. It isn’t a good idea to wait to power up your AC until the first hot day of the season, as this will stress and potentially damage the system. If you’ve decided that it’s time for a new unit, our skilled technicians at Controlled Aire would love to help by installing a new system for you. Contact us to improve your air conditioning quality today!